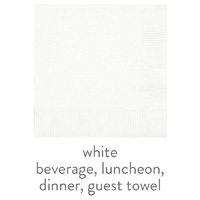 Personalized 3-Ply Digital Full Color Napkins and Guest Towels are available in 2 sizes (beverage/cocktail and luncheon) and ivory and whtie only with low minimums starting at quantities of 50. Pricing includes 4-color process printing. We DO NOT GUARANTEE 100% ARTWORK COLOR MATCHING ON FULL COLOR; printed colors may appear darker or lighter than artwork submitted and may appear to be a different shade of the color submitted. There is no extra set-up fee. Regular Printing/Production time is 7-14 business days INHOUSE depending on production volume plus UPS Ground shipping. 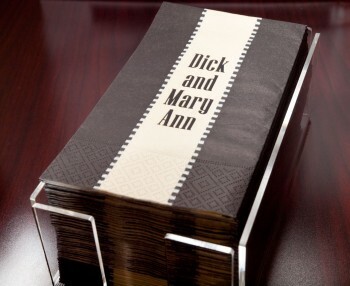 RUSH PRINTING IS NOT AVAILABLE ON DIGITAL FULL COLOR NAPKINS. 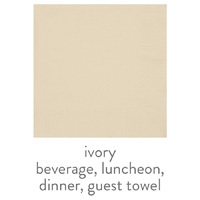 3PB Beverage 5.0" 5.0" 3.00" x 2.50" 3.00" x 3.00"
3PL Luncheon 6.5" 6.5" 4.00" x 2.50" 4.00" x 4.00"
3PT Towel 4.25" 8.0" 3.25" x 2.50" 3.25" x 4.75"
3PD Dinner 8.0" 8.0" 4.75" x 2.50" 4.75" x 4.75"